If you are experiencing an onslaught of commercial pop-ups whenever you browse the Internet, check whether you have Cling Clang installed on your computer. It is an adware application that comes from a big family of similar programs. To name just a few, there is Xaven, Bomlabio, Buzzsearch Deals and so on. Neither the aforementioned applications nor Cling Clang are extremely dangerous, but no security-minded would want to have them on his/her computer. Therefore, uninstall Cling Clang from your computer and then check for any other potentially unwanted programs, because you are bound to have some. The reason why we are saying that you should check for other unwanted applications is that Cling Clang usually arrives bundled with a number of programs. Despite the fact that you can access its home page via clingclang.biz, the download link on the page does not work, and if you click it you get redirected to a blank page. 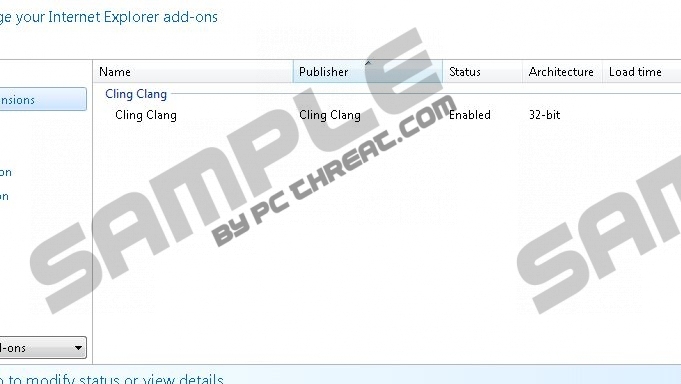 Thus, it means that if you have Cling Clang installed on your computer, you must have installed it together with some other application you have downloaded from a third party website. Here we should shed a light on another troubling phenomenon. It is natural that users want to get software for free, and sometimes they resort to downloading files from third party websites that offer it. Nevertheless, if you can get a free of charge application from the application from the official distributor, it is exactly where you should download it, because downloading via third party downloader may result in a variety of undesirable consequences. Installing Cling Clang on the system might one of the side-effects you have not been expecting. This application is compatible with Mozilla Firefox, Google Chrome and Internet Explorer web browsers. It claims that it can improve overall web browsing process, because it can collect search results according to your own preferences. However, Cling Clang can provide personalized search results and commercial coupons because it collects data on your web browsing habits. It means that in the long run, if Cling Clang gets exploited, it may also unintentionally expose you to corrupted content and malware threats. Hence, if you do not want to have unnecessary and potentially risky application on your computer, uninstall Cling Clang right now, and then scan the system with SpyHunter free scanner. This program will help you determine which programs might have arrived along with Cling Clang and you will be able to remove them automatically without any difficulties. If you need any help with Cling Clang removal or have questions about computer security in general, do not hesitate to contact us by leaving a comment in the box below. Select Uninstall a program and remove Cling Clang. Click Uninstall a program and remove Cling Clang. Navigate to Control Panel and open Add or remove programs. Quick & tested solution for Cling Clang removal.